This week, my mani didn't turn out quite as I envisioned. Ugh. I just hate when that happens, don't you? I mean, the end result was okay, but I'll probably end up trying the same design but with different colours. C'est la vie, right? I started with two coats of Intelligence, Integrity & Courage and when that was dry, got out my painter's tape and started cutting strips. 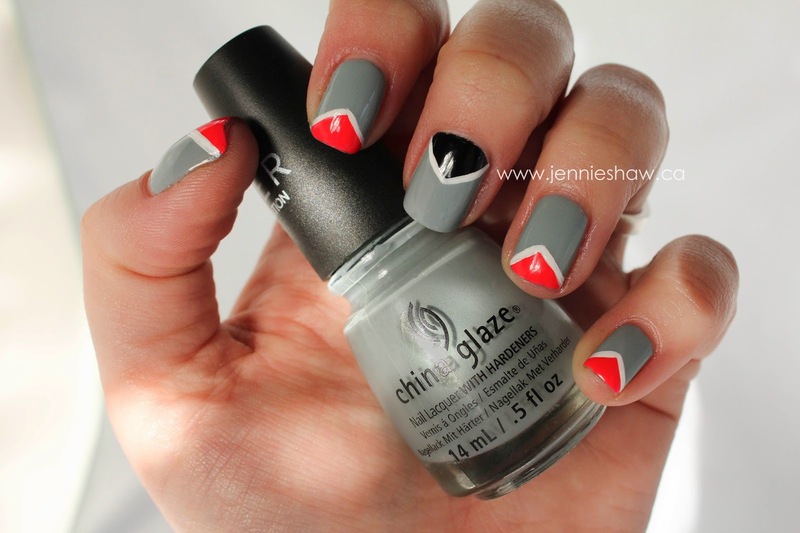 I placed them along the top of each nail (or bottom, in the case of my middle finger), creating a triangle. I rubbed the edges of the tape with my finger a couple of times to get a good seal, and then added two coats of Pool Party. After that was dry-ish, I peeled off the tape and then waited for it to dry, fully. The final touch was the white border, where I used standard Stripe Rite. 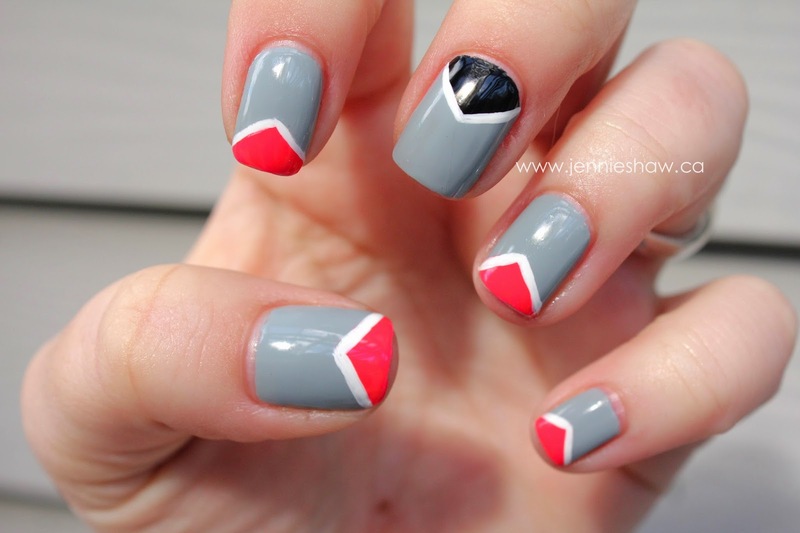 I think this mani's problem was putting the pink over the grey. I'd imagined a super bright pop of pink, but it ended up looking way more orangey-red. Not the worst, but still a booooo. Haha!! Did you have better luck than me? What did your nails look like this week? Link up and show 'em off! I hate it when the mani doesn't turn out how you want it to. The design came out great! 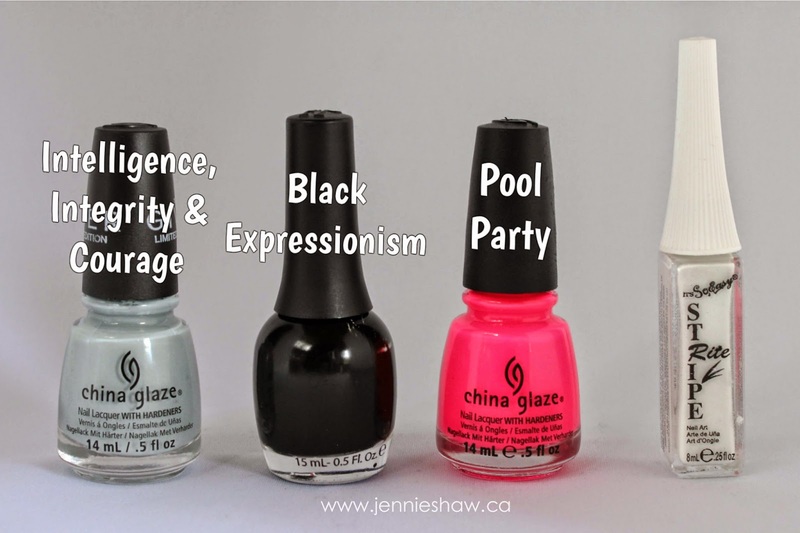 I love that with nail polish designs like this, the color pairings are endless. I look forward to the next time we see this design in whatever other color scheme you come up with!! I seem to be having a lot of those problems too this week! Grr. I still think it's cute! I see what you mean about the pink, but I still think the colour combo works. And your lines are so sharp!